If you have ever talked to anyone from Boston that follows college hockey you will quickly find that they think they invented hockey, skates and ice. They are mostly focused on each other, mostly the BU-BC Rivalry. And they want to beat Harvard, too - makes them look smarter. Three things are clear. They love their college hockey up there. They hate each other. People love to hate both teams, especially in the Hockey East. 1. They call themselves Boston College and are actually in Newton. **** this. Don't give the great city of Boston a bad name you pompous *****. 2. They take up a spot in the Beanpot meant for Boston schools. 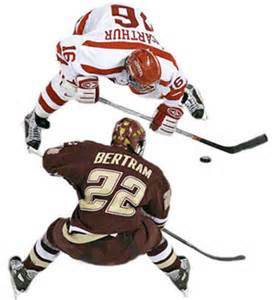 Denver has as much of a right to play in the beanpot as you. Let's start the UMASS-Boston rally to get them in. 3. Jerry York wears sweaters to hockey games. Maybe they are sweater vests. Either way they are ******* stupid. You're not playing 18 holes York. That will be in April while we're bring home #6. 4. Their fans are superfrauds! They only go to games on national TV or when the teams are good. ******* bandwagoners. 5. They claim Boston in their title. Cheap ******** need to pay or change the name to Newton College. Boston University's Arena- I think that I get more nervous than the players do when BC plays at Agganis because of the hype surrounding these games. There really is no better feeling in the world than running down those stairs after another Eagle beatdown @ The Jack Parker Rink (Besides beating them in the BC Invitational). The BU fans are your prototypical fanboys. They never show up for any other game but for BC, the place is rocking. You won't find a bunch of more classless people anywhere in the world than BU fans. The Rough em up F*** em up chat is as pathetic as the way they treat BC people there. One thing I love about the rink is their food...the best in Hockey East. We usually park over near Walter Brown but it is tough because it means you have to see more of that horrible campus on your way down. Love the place but absolutely despise the team that plays there. Boston University Students -- North Face? Check. UGG Boots? Check. Juicy Jumpsuits? You would never think of leaving your dorm without velour on, so...check! If you go to Boston University, you were most likely rejected by Harvard, and you are most likely rolling in the Benjamins. You’re ridiculously attractive, or at least that’s what your mom always told you when you were growing up. The B Line is your territory, and only your territory. Those hooligans from BC? They just wish they could go to BU. And DU? They couldn't be bothered...too busy hating. I am going to the BC game and will proudly wear my Booneskin cap. Can't wait to see the expression on the faces of the "BC hockey elites"!!! I've been to many DU games at BC and BU. We're always treated well there. Miller, were you at the NCAA's in New Hampshire a few years ago? I think I have a great picture of you which I put on Facebook. I'll be in Beantown, I get ill and depressed being at a game when we lose to an Eastern team.